Well, it's been a real 'hold onto your hats' kind of day today. We made a mad dash to the supermarket this morning for some essentials but, once home, it was hatches battened and comfies on. I most definitely consider a bunch of spring flowers as an essential on a wild January day, don't you? The Christmas decorations all came down on Monday and, whilst I was quite glad to pack them back into their box for another year, I do miss their prettiness. So I've decided to keep my vintage bauble lights up. 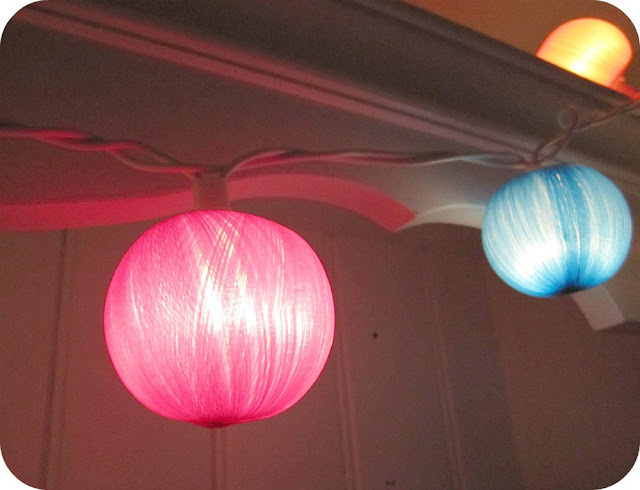 I treated myself to them from here at the beginning of December and I so love the cosy colourful glow they cast in the corner of the lounge. My crochet corner. Talking of crochet, this afternoon, I spent a couple of gloriously indulgent hours finishing off my bunting while the Blondies both did their own thing. It's now strung up above our bed and I'm tickled pink with it. I'll try and take some photos of it in situ over the next day or two to show you. Well, I'm off to bed now to gaze up at my latest make. All this pottering is very tiring you know! I too will leave just one decoration up as I can't bear to take them all down :-( I think the pom pom garland will have to stay. 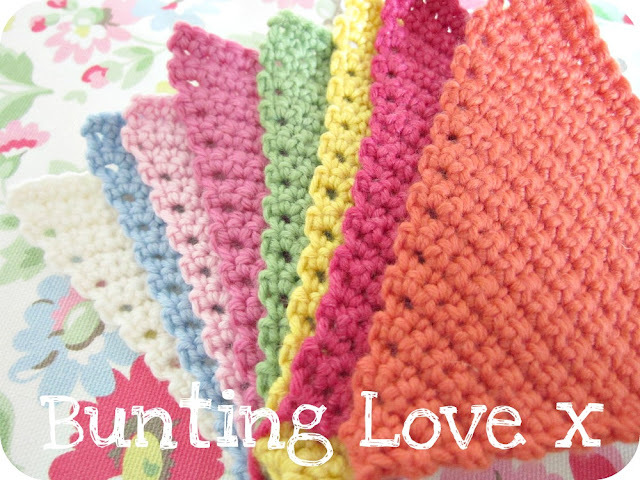 I love crochet bunting, so pretty! Crochet bunting... Love It! Have pinned it. Also adoring your jars in your header. Are they images from Tildas Studio? Please say they are as I have that book and that means I can copy you!!!! Love that bunting - the colours are gorgeous! Can't wait to see it in situ! Happy New Year beauty. You post brought me a warm, cheerful glow. Thanks!!!!!! LOVE the crocheted bunting and the flowers. I feel lush after getting all the Christmas stuff out of the way for another year. Hello there! Thank you for popping over to my blog and leaving such a lovely comment! Love, love, loving your tulips!!! I need some NOW! I'm also coveting your PiP jug :) look forward to seeing your bunting in it's new home. Hello Binny Heather, missed you in the land of blog. 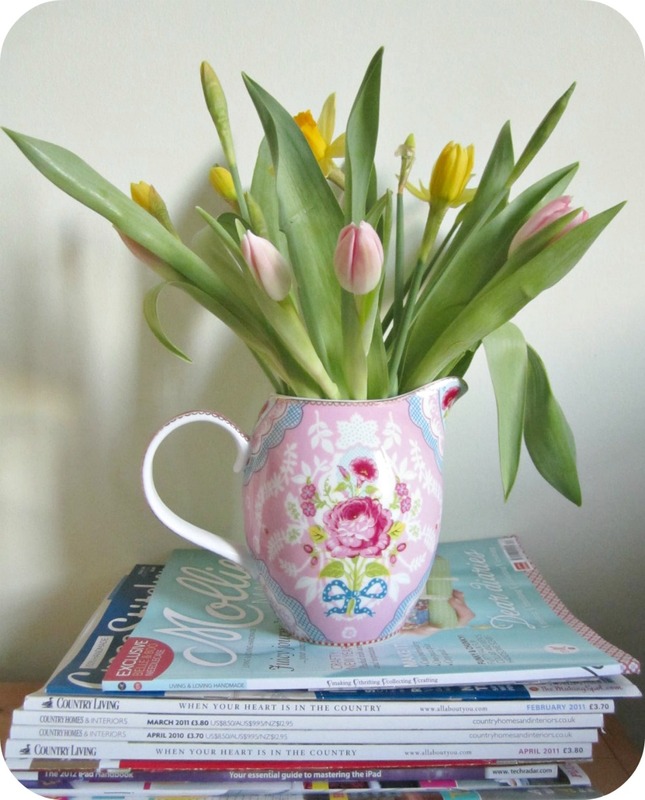 Such a pretty jug - I am a big fan of PiP studio! Love the bunting and love the writing on the photo - you're clearly some kind of technological genius, I can barely work my camera! Congratulations on having the first tulips I have seen anywhere this year! They are so pretty and a reminder of lovely things to come.